DES MOINES - The Iowa Barnstormers Head Coach and Director of Football Operations, Mike Hohensee, announced today that the team has been assigned rookies Dominique Johnson (WR) and Tyler Wells (OL). 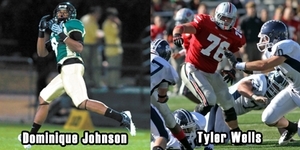 Johnson (6--3, 207, Cal Poly) joins the Iowa Barnstormers for his rookie season after signing with the Minnesota Vikings of the National Football League as an undrafted free agent in 2011. In his two-year Cal Poly career (09-10), Johnson totaled 90 catches for 1,375 yards and 10 touchdowns. As a leader of the Mustangs ofense, Johnson's signature game occurred in 2009 when he set a new program single-game record with five TD catches. Prior to transferring to Cal Poly, Johnson played two seasons with the UCLA Bruins where he was reocgnized for his great potential. Appearing in a total of 26 games, he collected 695 in receiving yards for a total of five touchdowns. In 2007, Johnson was named the team's offensive winner for Most Improved Player. Wells (6-5, 270, Grand View) has also been assigned to the Barnstormers roster for the 2014 season. During the last half of the 2013 season, he joined the Iowa roster after the team's offensive line was troubled by multiple injuries. Impressing the coaching staff, the Barnstormers look forward to bringing Wells back for a full-season opportunity. Season tickets are on sale now for the 2014 season for as little as $110 per seat. Season tickets make a great gift for the football fan in your family. So, don't miss a minute of the action this season! To order your seats or for more information, please cal the Barnstormers at (515) 633-2255, or log onto www.theiowabarnstormers.com.